We're gonna need fuel, right? First ensured I had the starter and anything else hooked up that the throttle bodies are going to bury, and routed the harnesses. 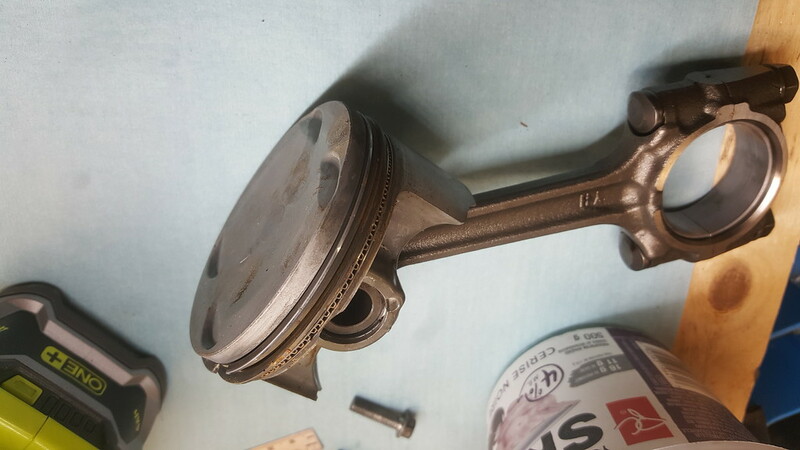 A little squirt of silicone spray just to wet the intake rubbers, then installed the throttle bodies. 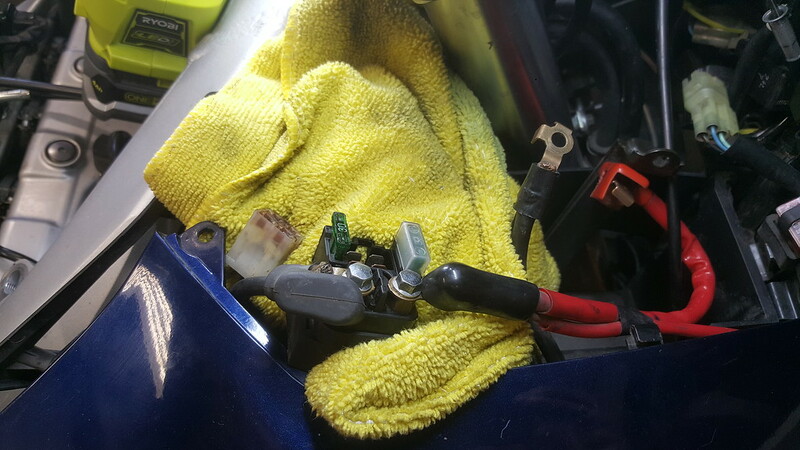 Oops, noticed I couldn't hook up the voltage regulator plug, wire was an inch short.... fished that out back under the TB's, re-routed to go along the brake lines, which gave me the length I needed. Glad I didn't have to pull the TB's as they were a bit of effort to install. 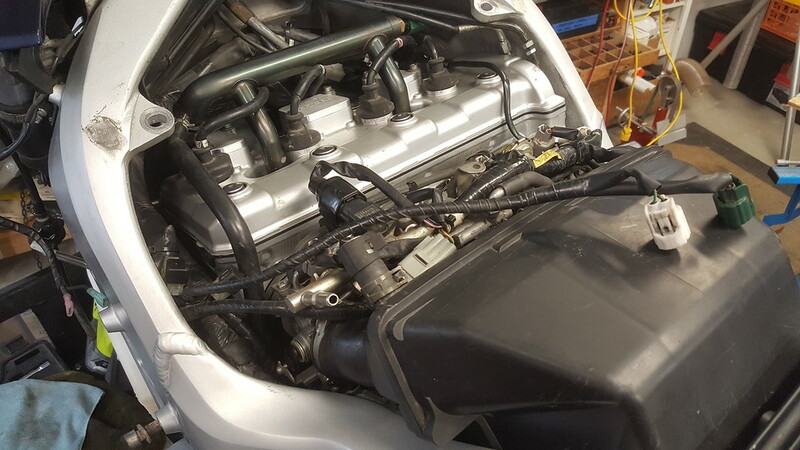 Looking good, got all the hoses ready for the air box... but what's wrong in the picture? Air box is next, but first... rear fender had been taken off, so I cleaned it all up and installed it. 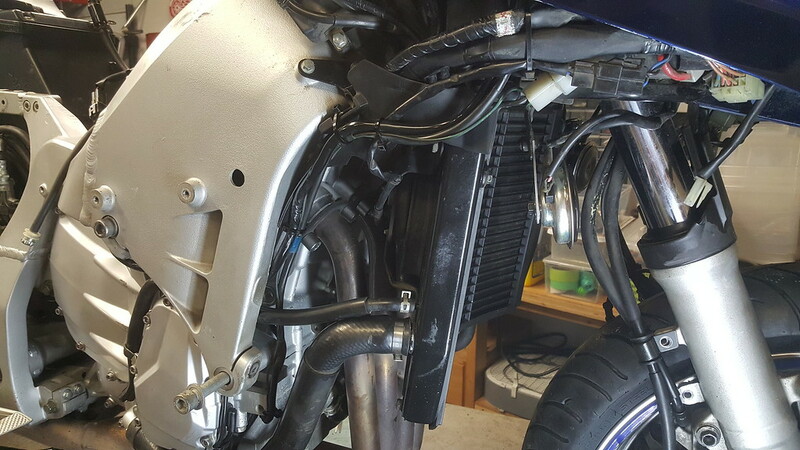 There is absolutely no reason it ever needed to be off because you can (and FSM agrees) remove/install the air box without messing with the rear fender. 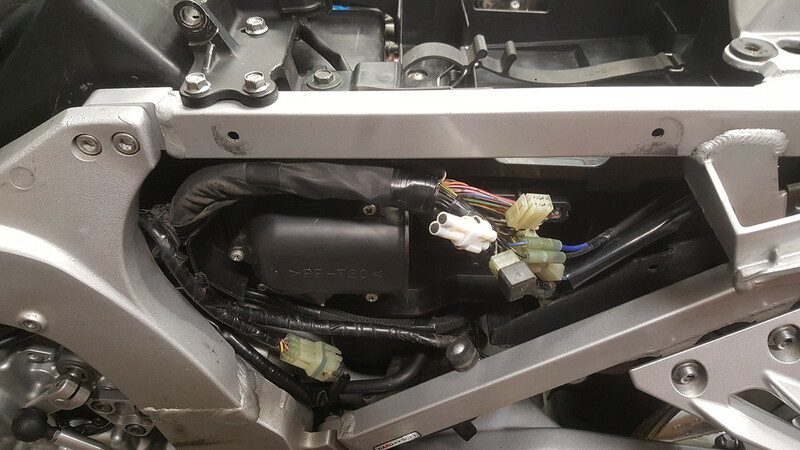 Rear fender holds the ABS ECU and cradles some wire harnesses. The same thing is wrong in this pic too. With airbox in place, I installed the fuel tank/front seat support, then comes the seat tray (not in this photo) and it has the main ECU mounted to the bottom of it. I had sprayed a little contact cleaner in the ECU connection the day before, so I blew it out with air and hooked it up. 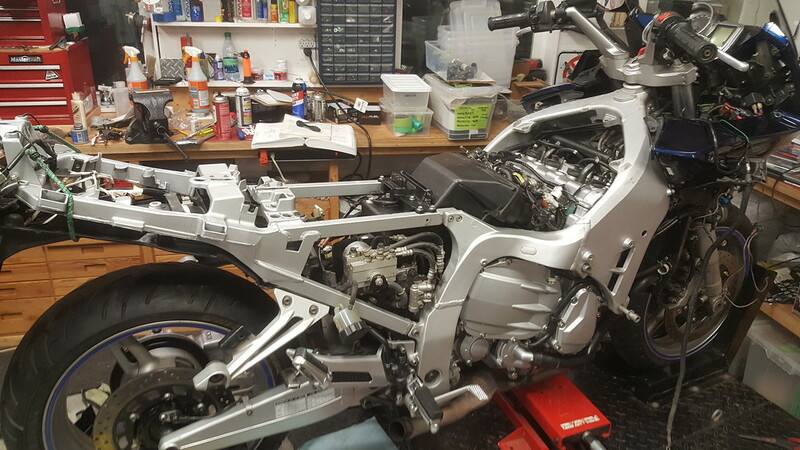 Next pic shows I have the rear fender held up by a bungie at the back end but I have the front end of it in place. Back end is held up by installing the tail light, but not quite ready for that. 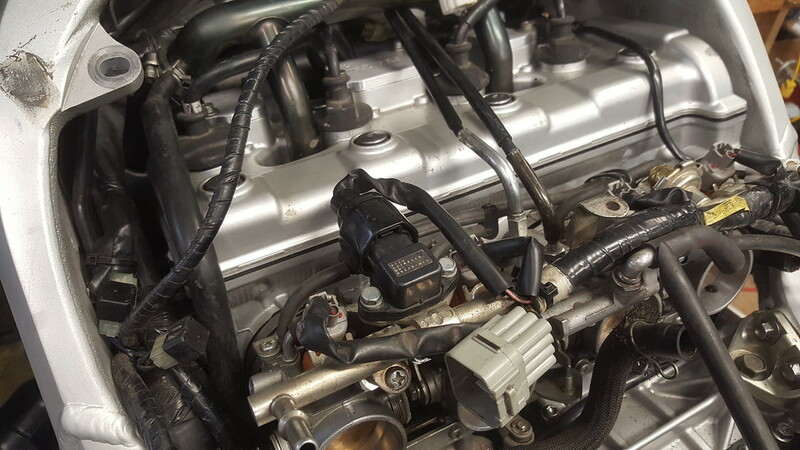 So back to the first pic, seems there's a coupla throttle cables tucked up on the right side of the valve cover. I tried my best to see how to hook up the return cable, no room to see..... gotta take the throttle bodies off!! Duh! This is what happens when nobody shows up to keep an eye on me and recite the FSM....... it'll cost me an hour or so, no biggie, gotta be done. Also, my exhaust gasket is delayed another day, so I kinda took it easy today, checked over the electrical situation up front, puttered around with some other things needed doing, had an afternoon nap and everything. Felt good. Ray... I'm on nights this week and next, but I'm going to make an effort to stop in and see this in the flesh. 'Would love to be there for the engine start up and rev. I am disappointed. You had the perfect opportunity to build a FJR scrambler, bobber or cafe racer... and you blew it. Hack, I'm getting there, will letcha know when that's a gonna happen. Pterodactyl I am so disappointed in myself too. But I thought it a bit heavy... the WR450 is sitting close by keeping an eye on me. Somebody came while I was out in the shop, but I found this on the porch this morning...... alrighty then, got it all filled, let it sit a bit and put it on the charger, and will leave it there for a day or two. Don't need it yet. Meanwhile, this did take me an hour. I had to undo the cables at the grip, while up there I noticed some burrs on the bar, so smoothed them all out so there will be no binding. Glad I did take the TB's back off, 'cuz now I know where the return cable attaches, and can probably do it without taking the TB's off (we are due to change cables on Andy's bike at next Tech Day). Looking better now, eh! 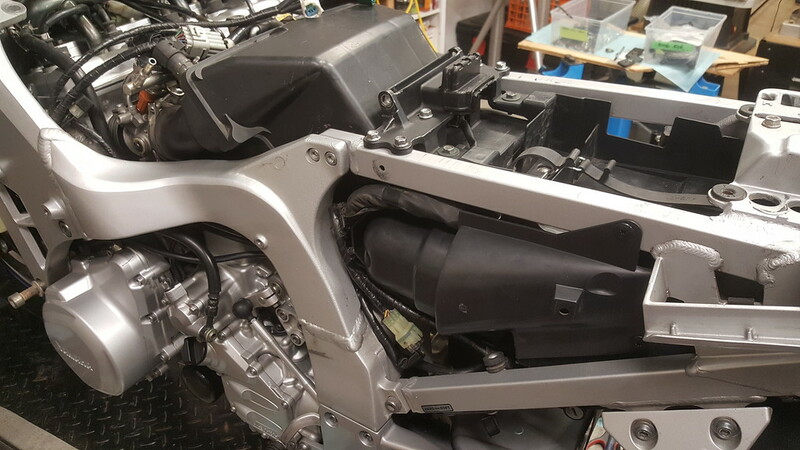 Shot of the front end of the rear fender, showing ABS ECU module and harnesses, for those that want to know what's under there. Ignore those thin wires to the right, that's the Hyperlites stuff in the tail, I have yet to decide if it's going or staying. 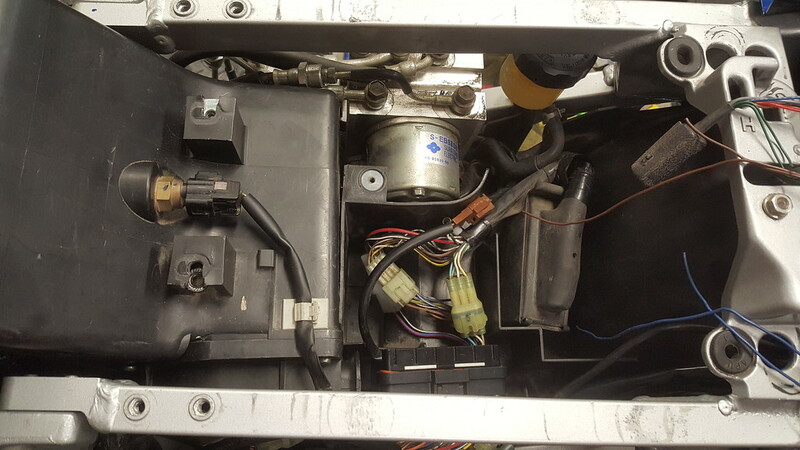 Next a shot of the seat tray, and attached to the bottom with two screws is the main ECU. 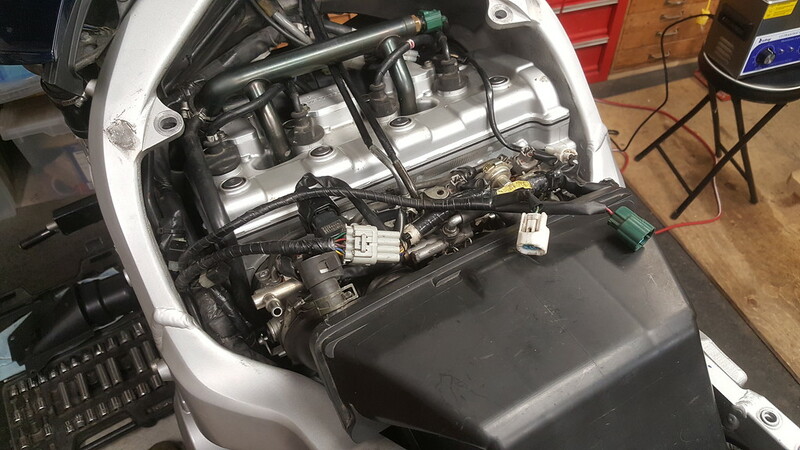 I've held up the ECU connector from the main harness to it, and have installed the air cleaner with the main harness still hanging out. 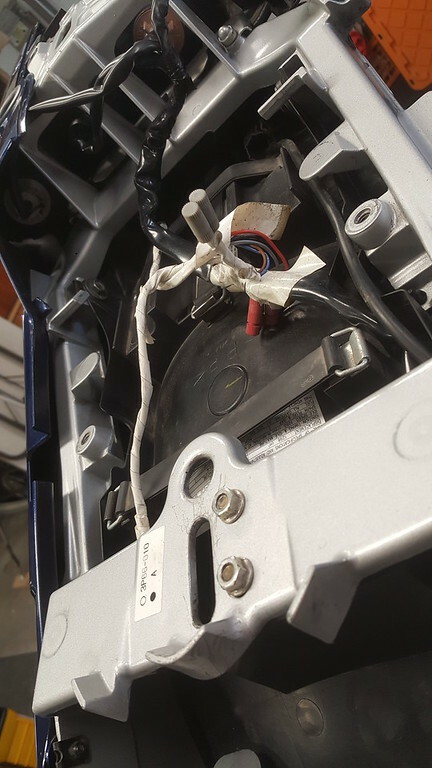 The little harness with the blue and black wire with bullet connectors is for the licence plate light, there's a low current ground spider with the black cap, and a white two-way (blanked off) and a 4-way connector. Anyone know what they are for? All other wire connectors are unique, and pretty much you can't plug the wrong thing into the wrong thing. 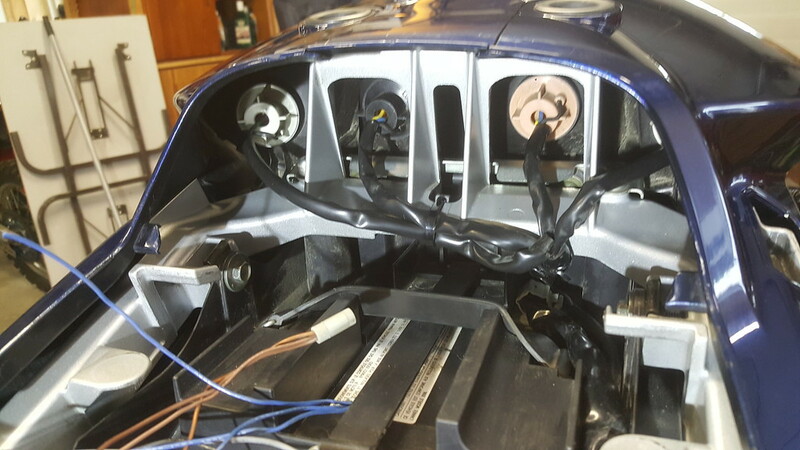 Main harnesses retrained to go around the air cleaner intake area. So looky here, what would you call this.... I suppose some would say optimism, but I say Perfectly Confident (that I'm done here don't have to go back into this area). 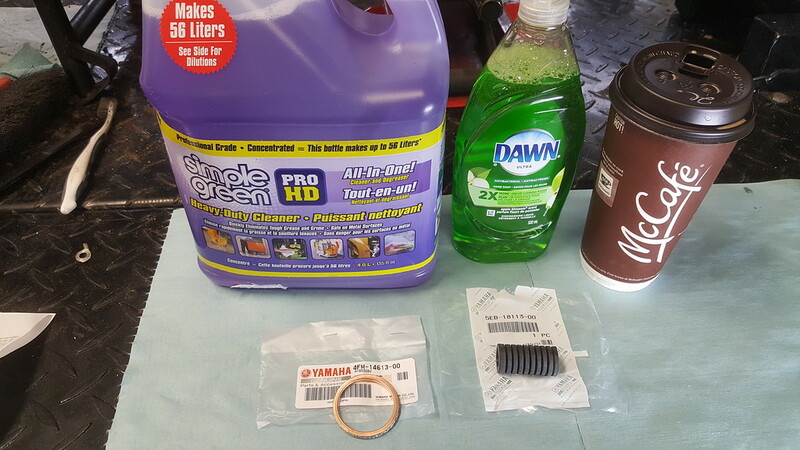 A little off topic perhaps, but I had acquired an ultrasonic cleaner and I needed some supplies...... picked up the spklbuk-approved version of SG, a little dish soap, a Rayzerman-approved beverage, and..... my Yamaha parts!! First thing I did was put on the new rubber, took all of 4 seconds. Of course, I shoulda had the cleaner in use a couple of weeks ago, I've been cleaning everything by hand. So I dumped in half a litre of SG, squirt of Dawn, big cuppa hot water, and dumped in the remains of my hardware, a healthy pound or so. This was my first go with an ultrasonic cleaner, so this was an experiment... was the batch to big? Dialed it up to 150F and 20 minutes and let 'er hum. The answer is, the batch wasn't really too big, but I wouldn't put as much in next time. The solution did get dirty so somethings working right. 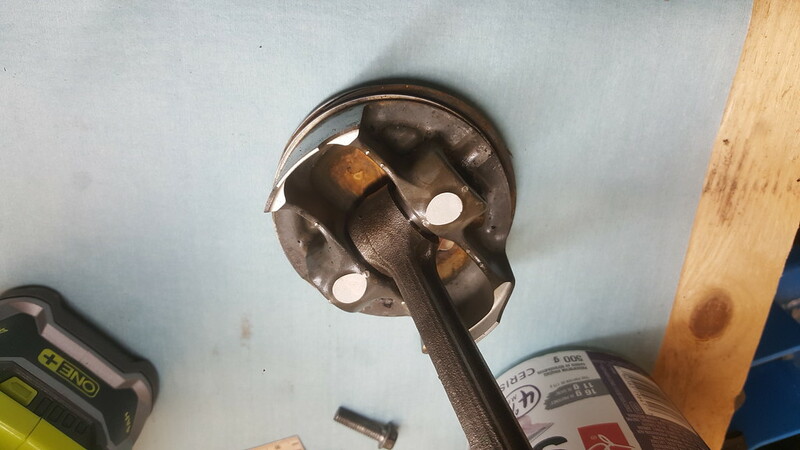 It loves castings, see the shiny balance shaft adjuster. 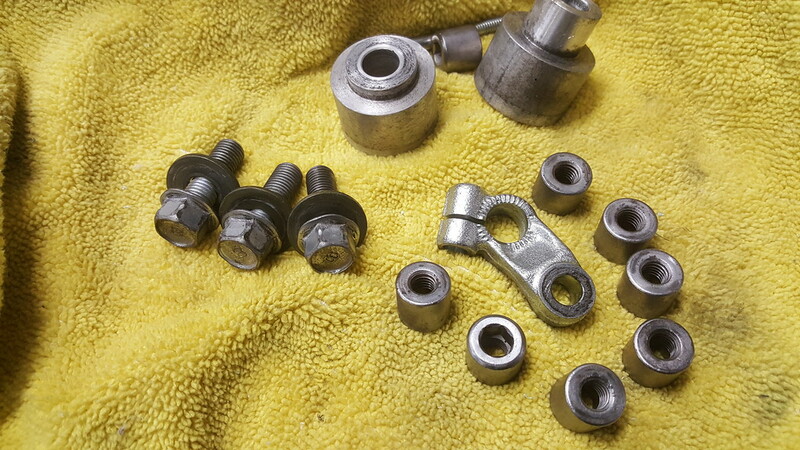 If your parts have grease or dried loctite on them, it won't take it off, best wipe them down if they are greasy. But stuff does wipe up way easier after the hot mini-jacuzzi. I'm not going to use it much on the bike now, and will learn more when I clean up other stuff. "white two-way (blanked off) and a 4-way connector. Anyone know what they are for?" 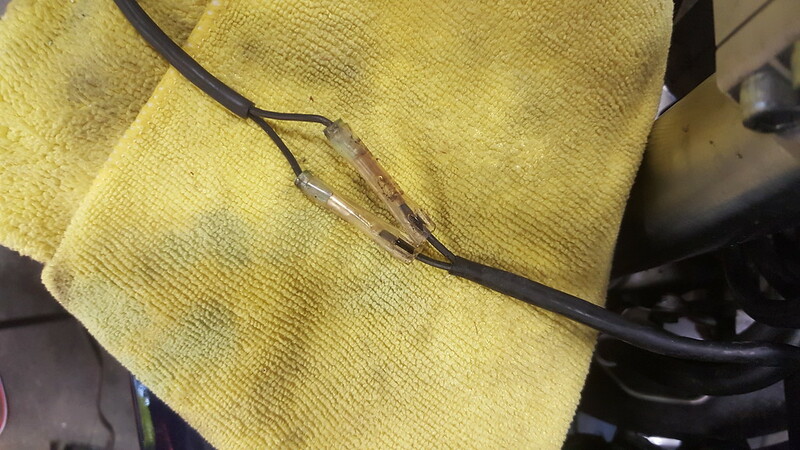 I believe these connections were for the optional alarm system Yamaha had available. Right you are.... it was more of a rhetorical question at first, had to look it up. Everything went together so well, and I had this here spare connector. Surprised it didn't have a cap of some sort on it, but the white one did. BTW, there is switched power in the white one iff'n ya need a source to trigger your fuse block, er something but the wire gauge is kinda small. This is all gone for Gen3. 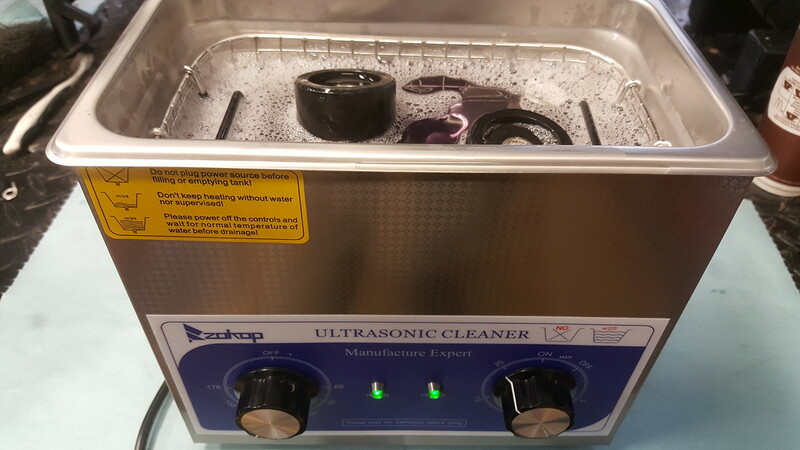 I was going to buy an ultrasonic cleaner but then I remembered a trick my granddad used years ago. Boiling water and pine sol or whatever you favorite cleaner. easy peasy. You ever see a grown man naked Billy? A lot has changed, since the 17th century. I've soaked many a carb body in a 5 gallon bucket of strong pine sol solution. I heard that the formula changed, though. Still subscribed, Ray. I'm reading and learning, man. I've been working on cleaning up the electrical in between other things, and since I had to button up the rear fender and tail light, might as well get the back end done. So everthing got a good scrub before it went on and now's the only chance to get into those places you can't get to. Here is a set of Hyperlites, and the lites themselves have been snipped off. Loverly white tape job just overjoys me, so I took it all off to see what's under there. Nothing special, just the Hyperlite workings, all tied into the bikes tail light harness. I was undecided what to do with the Hyperlites, but decided to put stuff back together first, decide later. So this is with rear fender and tail light installed. I also took the opportunity to undo the tail light wires and re-route them in front of the subframe. You will also notice a hint of blue in the pic. So this is what it looks like now... hey Mama Yama, you must have originally intended it to be this way!! There's more than enough wire... Jeez now we can actually change our tail light bulbs without fighting over everything. Got rid of the white tape, and thought about shrink tubing to make it look nice..... finally said no, so Hyperlites are gone, Postitaps removed and harness restored. Next guy or gal gets a clean slate and can customize to his/her preferences. Oh lookie, a bit more blue. Well, back to what really has to get done. Installing the exhaust headers will let me finish up a whole bunch of things. So here we are, all done up. Wiring cleaned up, stock horns installed with original wires, radiator installed, rad hoses connected. 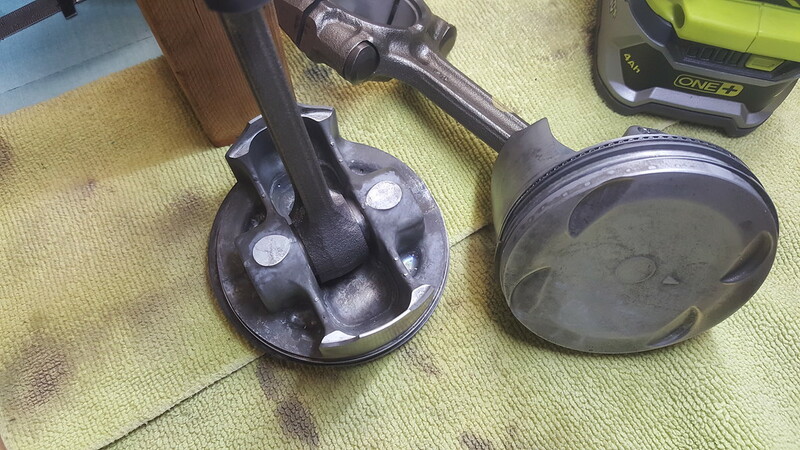 The smaller hose is a bypass hose that comes off the water pump. Lower engine mount bolt is loose installed as there are frame sliders to install someday when the big blue pieces go on. Note the harness at the top with the white label is the recall harness for the ground spider, it adds some bulk as it is substantial. 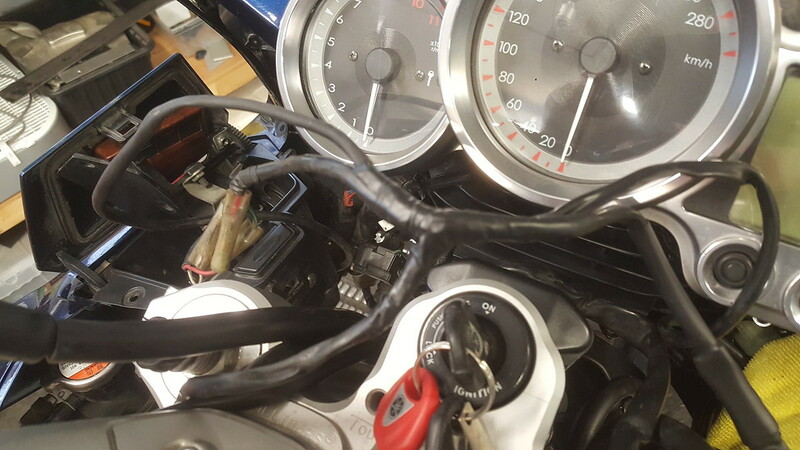 Around the other side, rad hoses done, wiring done, stock horn, and had to replace the overflow hose as it was old and brittle/cracked and simply had seen too much heat over time. I used some clear tubing and wrapped it with foil duct tape as a heat shield. I'll tweak the routing once the overflow reservoir goes on. It should not be behind that coolant hose but outside of it. 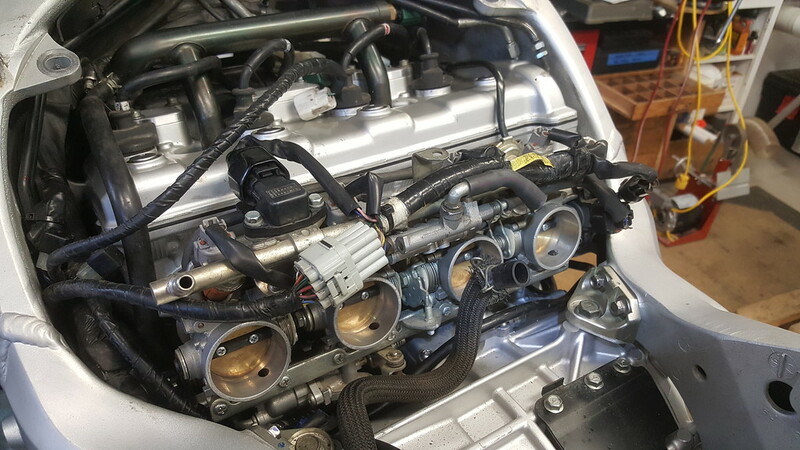 That hose BTW, is for the hot wax motor on the throttle bodies for the fast idle. 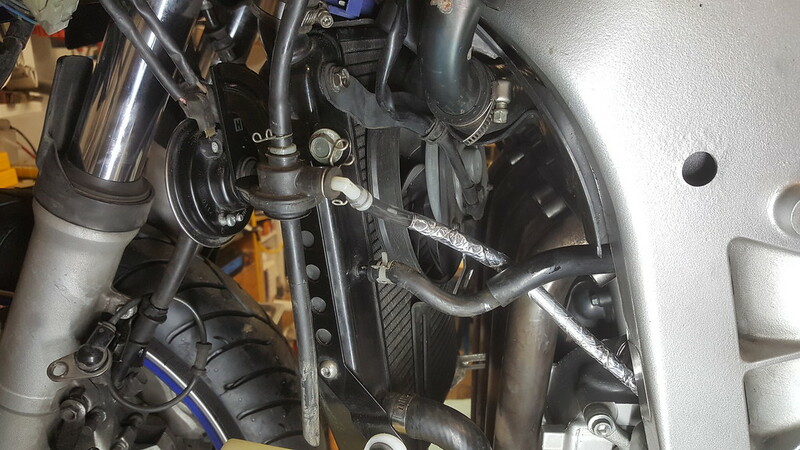 So here we go, reservoir installed, overflow hose re-routed and it makes it way down to the oil filter (in case you were wondering what that hose is down there). Now what the heck, let's pour in some koolaid. Marked the Low and Full marks and I did intentionally overfill it somewhat. When first cooling cycle occurs, some will get sucked into the rad, should end up at the full mark. I like full, I don't like minimums. So...I'm turning Blue with envy. This looks to be a great thread...thanks for documenting your work. Yeah... what's up with the blue. Two tone in the works, eh? 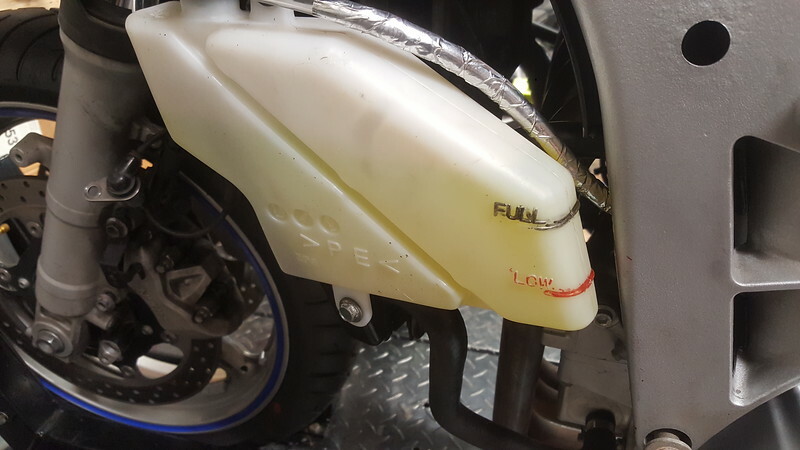 I also filled to the "full" mark last week on my own bike. I figured there is plenty of volume above the that mark to take care of expansion, if thinks get expansive, that is what overflow tubes are for, and on like June 2017, when it was 105 in the shade, every little bit helps. We should see a running bike today, right?????? Great job so far! Well done Ray. Bike is not going to run this weekend, I think we need a battery in there or sumthin. Day off Sunday, other engagements. No hurry, need my coffee and there's crossword puzzles to do as well as this jigsaw puzzle of a bike. Must admit I've been so involved that I'm not taking afternoon naps, LOL.. Lots of stuff to do yet on the front end, might even have a special guest coming on Monday... maybe we'll push the launch button then, who knows. Stay tuned for updates. Glad you're liking the blue, me too. 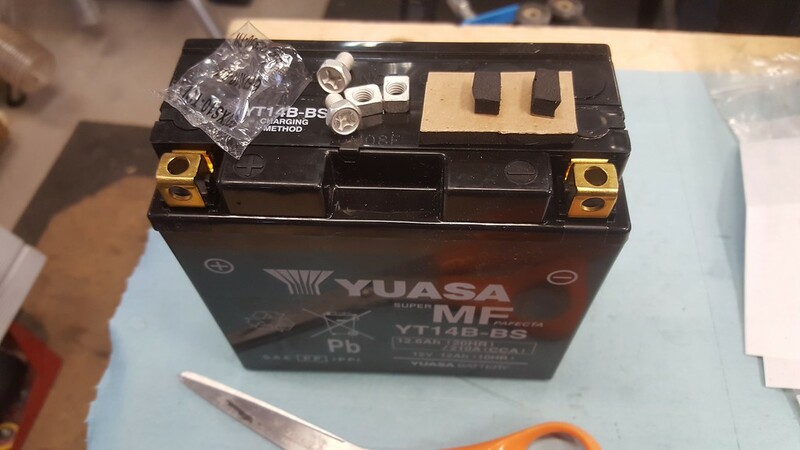 Yeah, cause putting a battery in is a complex task? Put a motor in by himself? 1 hour. 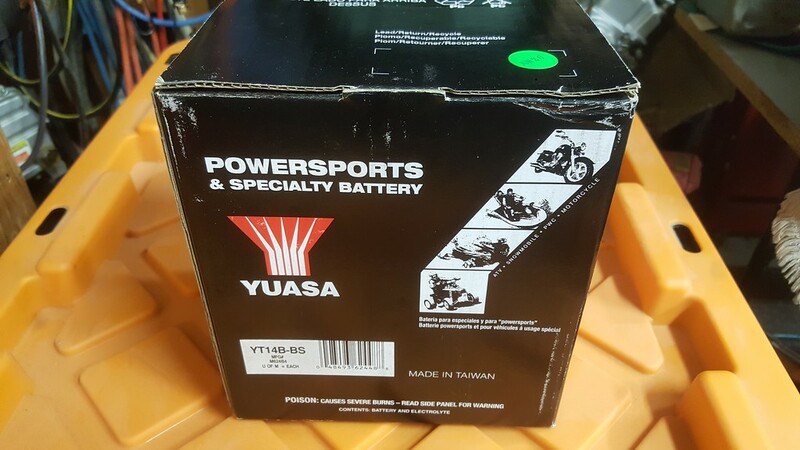 Installing a battery? Can’t get it done this weekend. I’ve never been so disappointed in my life....well, maybe a few times....okay, daily, but that’s not the point. OK OK, we'll get to the battery... but I want you to know it was no joke about the crosswords. 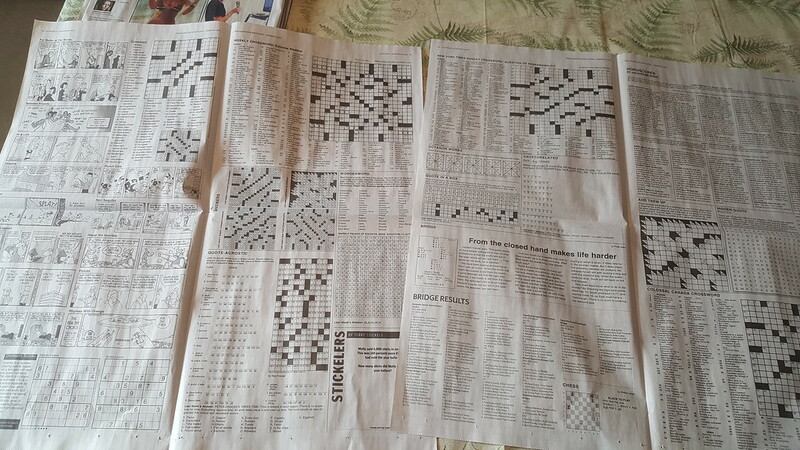 I pick up the local rag's Weekend edition and this is what I get..... multiple pages of pictures, 'cuz I need pictures. Then on the back side, lookie all the word stuff. 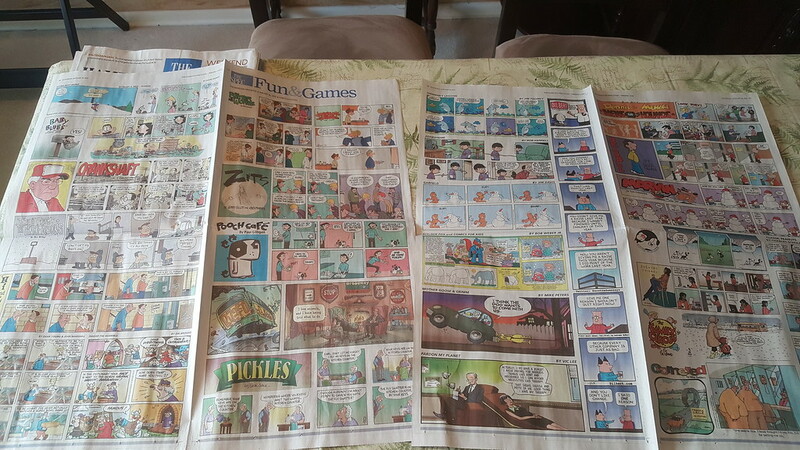 Bonus they give us a version of the New York Times, and there's more word stuff. 15 minutes here, 15 minutes there... they get done mostly by the third Saturday in my week (I have 6 plus 1 Sunday). 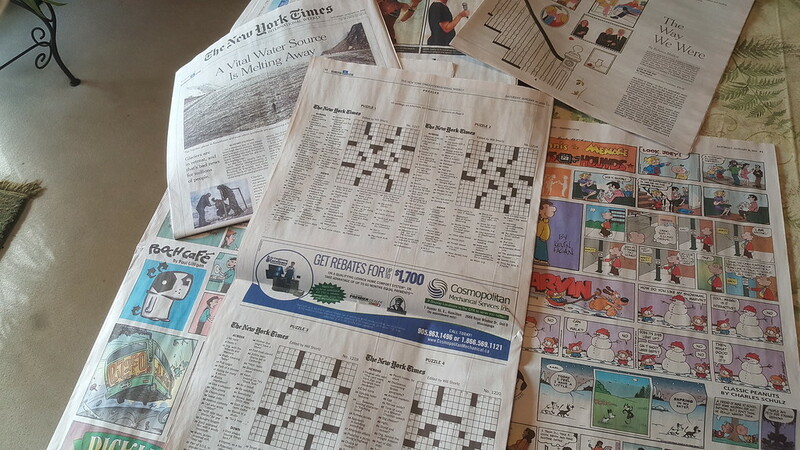 However, no crosswords will get done today, nor did I get an afternoon nap. Oh yes..... the battery.... it helps to cut a couple of pieces of foam to hold your nuts up while you're screwing on the terminals. With that ready to go, let's talk heated grips first.... I thought Canajan FJR's all came with OEM heated grips as standard equipment. 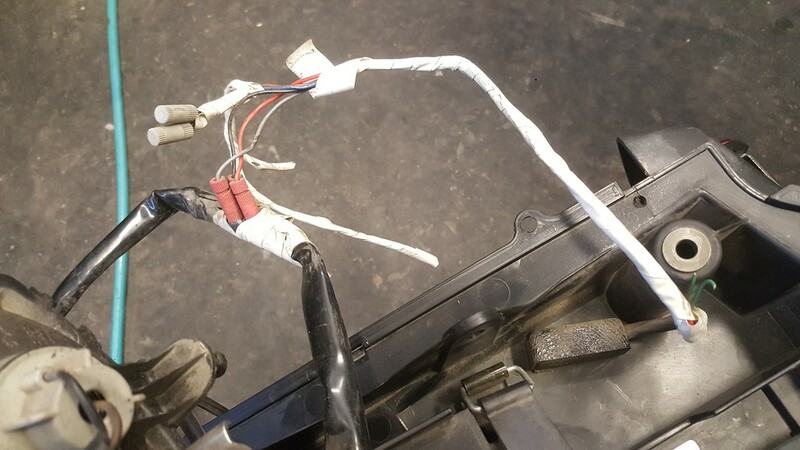 Apparently not in '06, so PO had an OEM kit installed by the dealer, and I spent a lot of time figuring out power and ground, wire routing, and then to test if they actually worked. More later. So first had to remove the starter relay to remove a wire that I snipped off when removing the homemade relay harness crap. They used the starter relay + battery feed as power supply. While that was out, cleaned it up, it was very dirty. 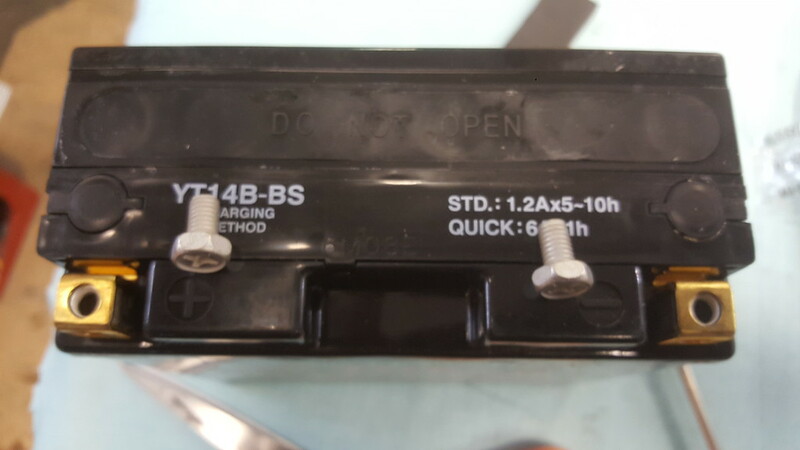 Note this is a single fused relay, 30 amp fuse on the right with plastic cover, spare fuse on the left. Here it is all back together ready to go. Fairing held outboard by a piece of 2x3, dropping in the battery piece of cake. 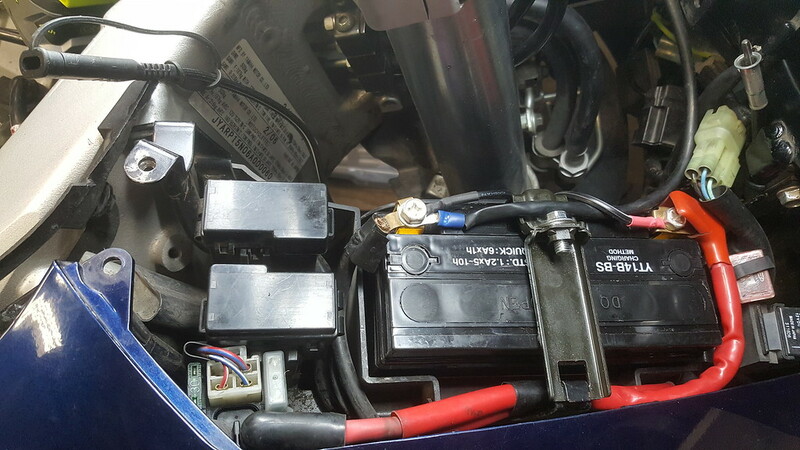 Here it is all hooked up with the blue eyelet being the new ground for the heated grips, and a Battery Tender harness run down beside the battery and back up to where the SAE plug will reside under the front edge of the fuel tank, hidden until you need it. By the positive terminal, I had removed the ABS connector from its mount, will install an ABS test harness later. 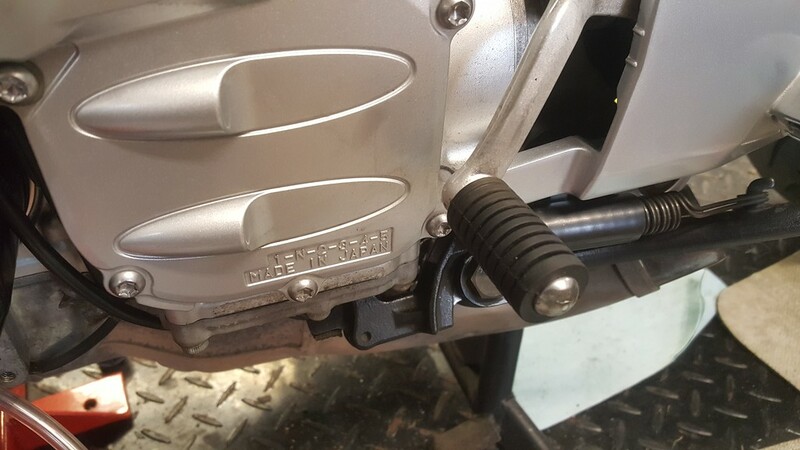 Got the heated grip thing all figured out, unwrapped some rather ugly taping and routing job someone did to hide these bullet connectors (which are waterproof BTW), but nobody wants to look at them. I don't have a pic of the ugly taping, but here is what the Yamaha kit has for connectors to each grip and there's another set to go to the controller. 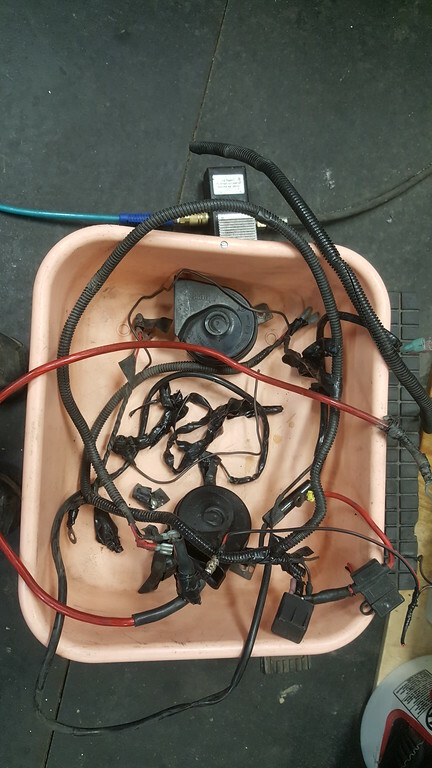 Oddly enough, the dealer had used the glove box lighter socket feed as power. 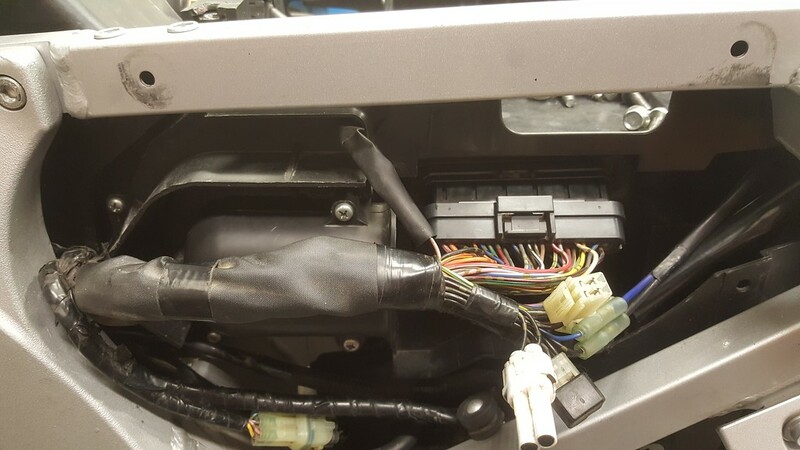 Basically saying, the add-on kit is not tied into the ECU like the factory ones, and should work independently as long as the ignition is on. Should is the operative word. While it was all untaped, I turned on the ignition, watched the instruments boot up and Neutral light come on, fuel gauge flashing because there's no fuel tank hooked up yet.... she lives!! Now to test the heated grips. Turned on the controller and waited 5 minutes (Gen2 grips were slow to heat up). No heat, crap. Unplugged each grip, check resistance, they both had about 6.4 ohms, so no shorts, no opens, should work. Power is getting to the controller, ground is good, power feed is good, fuse is good. Disconnected the controller, rigged a jumper so the grips are in series as they should be, hooked it direct to battery. I was getting heat after a couple of minutes, OK so the grips are OK. Plugged the controller back in, dialed it up, turned on the ignition, waited 15 minutes. No heat...... so, mothballing this issue for the moment, confident the wiring is good, everything unplugged and treated with contact paste, plugged back in, so installed shrink tube to pretty things up, routed all the wires, zip ties, etc. No wear points, no hanging up if bars turned, etc. A lotta time but gotta do it while things are accessible. Pic of my shrink tube and taping in progress, leaving the controller connectors unwrapped as they will be hidden and are waterproof. 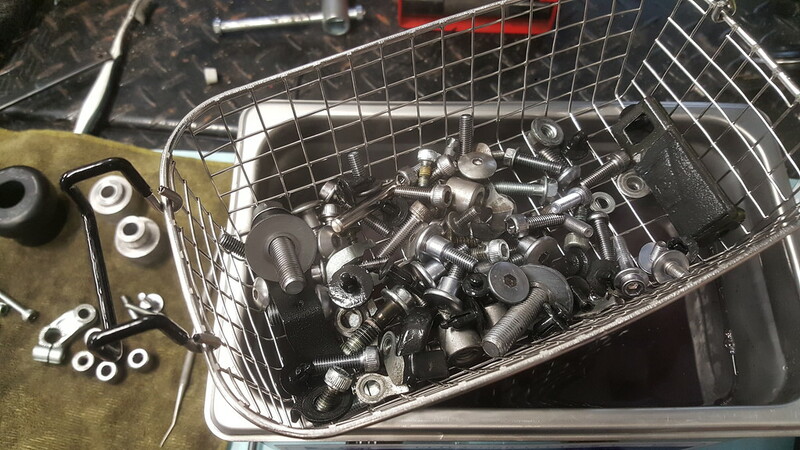 Set them aside to dry, I will store them away after a coating of oil. That's all you get for today, and it took a big chunk of the day.